I’ve just seen the documentary Fresh, and I’m awash in good intentions to try organic gardening. Alas, one look at my desolate garden beds (is that old drip sprinkler even functional?) and my heart sinks—who has the time? Fortuitously a friend tells me about Community Supported Agriculture (aka CSAs) and hope is renewed: I can participate in the reinvention of the industrial food chain without even buying my own composter. CSAs, which have been around for over a decade, are farms supported by a community of members, or “shareholders,” who provide financial backing and reap their reward in produce. Becoming a member is often as easy as signing up online and paying a weekly, monthly, or seasonal stipend. 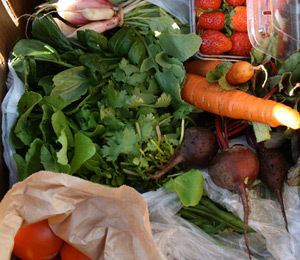 CSAs deliver produce to members at prearranged sites, often at local farmers markets. Tierra Miguel has delivered more than 1,000 tons of organic produce to local families and schools in the past decade and has hosted more than 30,000 children and adults for its educational programs. About half of the farm’s 85 acres are preserved as a wildlife corridor, which provides habitat for native flora and fauna. “If you come out to visit the farm, you can really see it. It’s incredibly diverse,” says Shoshana Raskas, Tierra Miguel’s CSA coordinator. Hurrah for the snakes and the bees and my carbon footprint, but how are the vegetables? After minimal paperwork, I signed on as a “member,” and the day of my first delivery arrived in short order. I have to admit, I am a sporadic vegetable enthusiast—some weeks I go on real benders and stock the refrigerator with my homemade ratatouille, but other weeks I find myself reaching around some wilting salad bags for the leftover pizza. Any commitment issues I may have been harboring, though, evaporated the instant I saw my first vegetable box. It was nicely layered with a bag of 12 large tomatoes as well as green beans and okra. Root vegetables—beets, carrots, and radishes—were clumped under generous bags of greens (tatsoi and arugula) and herbs (sage and cilantro). A carton of strawberries added festive color. Two opposing concerns preoccupy those who are considering CSAs: Will the box have enough vegetables to be worth the money? And how will I ever cook all these vegetables? After perusing my lovely box of vegetables, these seemingly contradictory anxieties were somewhat allayed. My seasonal membership breaks down to roughly $45.65 per box, and I am to receive one box every two weeks. If we commit to eating our daily vegetables (and who wouldn’t with all these beauties lying around? ), my family of four may mow through this box before we are due for our next delivery, so I expect to be supplementing from local markets. In all, my vegetable bill could end up being a bit higher than without the CSA, but I suppose I could factor in the price of the pleasure I derive from knowing mother earth is well cared for. As for how to cook all these vegetables—hmmm. Ratatouille, anyone?